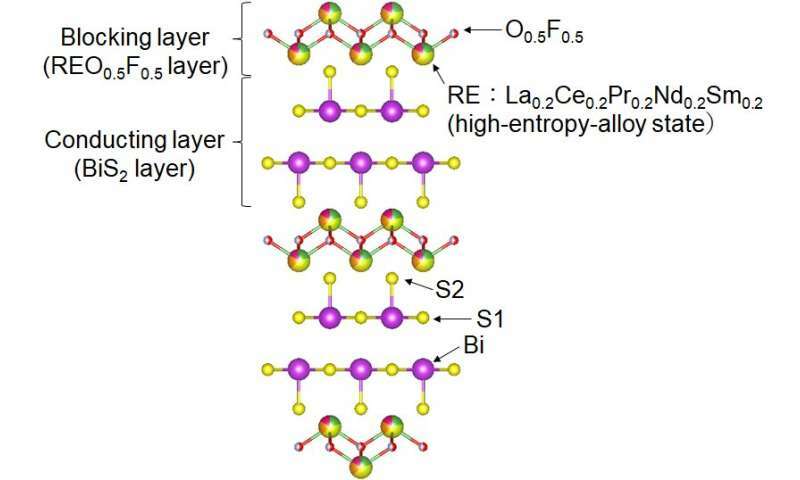 Researchers from Tokyo Metropolitan University have created new superconductors made of layers of bismuth sulfide (BiS2) and a high-entropy rare earth alloy oxyfluoride, containing five rare earth (RE) elements at the same crystallographic site. The new material retains superconducting properties over a wider range of lattice parameters than materials without high-entropy alloy states. Their work promises an exciting new strategy for designing new layered superconductors, a potentially key development in the search for high-temperature superconductors. The team's new materials, with different proportions of REs (10 to 30 percent), exhibited enhanced superconducting properties; in particular, materials with the same period in their molecular structure exhibited a superconducting transition at higher temperatures when the blocking layer contained a high entropy alloy. They believe that the high entropy alloy helps to stabilize the crystal structure of the superconducting layer.